Fruits, vegetables, and salads are full of important nutrients – but many of them can be lost before they land on your plate. Utopia shows you how to set your fridge to the ideal temperature and optimize food storage. Not all foods stay fresher and last longer in the fridge. Many foods simply don’t need to be stored in the refrigerator and some are even harmed by the cold. The optimal temperature in your fridge is 7°C (44°F). If, instead of a thermometer, your fridge has a regulator with settings from 1-6 or 2-7, set the regulator to 1 or 2 (warmer setting). Many appliances are set too cold. As a rule of thumb, if your butter isn’t spreadable, then the fridge is too cold and should be adjusted to a warmer setting. The optimal temperature for your freezer is -18°C (0°F). Running your freezer just one degree colder can increase the power consumption by up to six percent – an unnecessary waste of energy. If you want your foods to stay fresh longer, you should put them into the correct shelf in your fridge. Many produce and other products cannot be stored in certain shelves/compartments. Some products are not even suitable to be put in the fridge at all. The air on the top shelves is up to six degrees warmer than on the lower shelves. This is because the cold air drops from top of the fridge to bottom – independent from the temperature settings. Top Shelf 8°C (46°F) – cheese and packaged foods: The top shelf of your fridge is well-suited for cheese, packaged leftovers and deli meats. 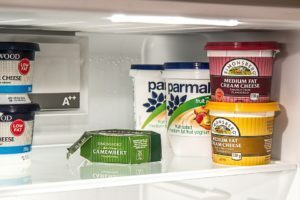 Middle Shelf 5°C (41°F) – fresh dairy products: The middle shelf is the best spot for your dairy products (yogurt, cottage cheese, milk, etc.) It’s also great for opened jars of fruits and vegetables. Lower Drawers 8°C (46°F) – fresh fruits and vegetables: Because oxygen, humidity, heat, and light neutralize the vitamins in your fresh produce, the drawers at the bottom of your refrigerator are great places to protect your colorful fruits (berries, apricots, cherries, etc.) and vegetables such as lettuce, spinach, mushrooms, carrots, celery, and asparagus. Tropical fruits (e.g. pineapples, mangoes, bananas, citrus fruits, etc.) should not be stored in the refrigerator or they will develop brown, watery spots. Vegetables with a high water content (cucumbers, bell peppers, zucchini, tomatoes, etc.) lose some of their flavor when stored in the fridge. Many root vegetables such as potatoes, garlic, and onions, do not like low temperatures and are likely to sprout if it is too cold for them. It’s better to store them in the cellar or in a dark cupboard. Put the food into the refrigerator immediately after buying it. Don’t overfill the fridge or the air cannot circulate properly, preventing the fridge from cooling properly. Place the newly purchased products behind the older products. This makes it easier to use food prior to its “best before” date. Store leftovers and fresh foods in glass or porcelain containers with a lid or a plate on top. This maintains freshness and flavor without producing unnecessary waste. If you have a storage room or a cellar, use it to store the fruits and vegetables that are sensitive to cold. Only store fruits and vegetables for a short period of time. Even under optimal storage conditions, nutrients such as vitamins, minerals and fiber can be quickly lost. Maintaining the right temperature in your fridge may require using a lower setting in summer and a higher setting in winter. Always make sure that the door of your refrigerator is closed properly. Defrost your fridge periodically. Frost and ice accumulation on the walls lowers the cooling effect and uses more energy. Why not empty out and defrost your fridge the next time you go on holiday? You’ll lower your electric bill and your fridge will work more efficiently. Important: Regulators with numbers from 1 to 7 do not directly correspond with temperature. The regulator works within a scale: 1 is the warmest setting, 7 is the coldest. The correct setting for you will most likely be around 3.